1. To cause (a vapor) to liquefy. 2. Referring to a vapor, to liquefy. 3. 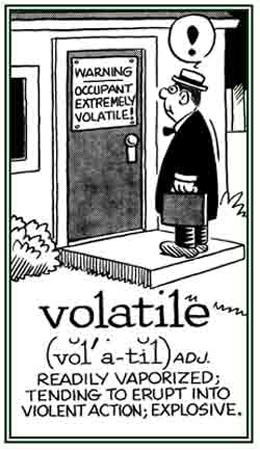 To remove volatile material from. A constellation in the Southern Hemisphere. 1. Used as a direction in music meaning "moving with light rapidity". 2. A two-wheeled carriage formerly much used in Cuba. The body is in front of the axle; the driver rides on the horse. 1. A reference to something which quickly evaporates at normal pressures and temperatures: One volatile substance is acetone, which is used in varnishes as a solvent, and it can pass off readily as a vapor; especially, when heated. 2. Descriptive of something that is capable of being readily vaporized: A volatile anesthetic is a chemical compound which can be administered by inhalation when using an anesthesia mask. 3. Relating to someone who is violent or explosive in nature: Steven was known to have a volatile and erratic temper, so he didn’t have many friends. 4. Pertaining to a condition which tends to or threaten ot to break out into open violence; explosive: There are many volatile situations in the current U.S. political administration. 5. Etymology: from Latin volatilis, "fleeting, transitory; swift, rapid; flying"; from volare, "to fly" or from volo, "I fly." © ALL rights are reserved. 1. Readily vaporizable at a relatively low temperature. 2. Flying or having the power to fly. 4. Easily aroused; such as, volatile suspicions. 5. A tendency to erupt into violence; explosive; such as, a volatile temper. 6. That which is haracterized by or subject to rapid or unexpected change; including, a volatile stock market. 7: Anything which is difficult to capture or to hold permanently; evanescent; transitory. 1. The property of changing readily from a solid or a liquid to a vapor. 2. The trait of being unpredictably irresolute: "The volatility of the financial market drove many investors away." 3. Being easily excited; excitability. A reference to substances which are capable of being volatilized; that is, evaporable. 1. Conversion into a vapor or gas without chemical changes. 2. A condition in which something passes off into a vapor. 3. 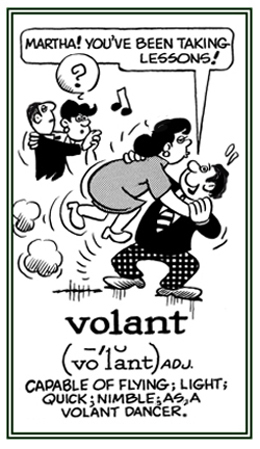 The act or process of rendering volatile; that is, causing something to rise and float in the air. 1. To change, or convert, into a vapor, or to cause a solid or liquid to be changed into a vapor. 2. To evaporate, to cause to evaporate, or to turn into a vapor from the liquid or solid state. 3. To cause to pass off in vapor or invisible effluvia, and to rise and float in the air. A light pastry shell containing a ragout of fish or meat.